About a third of all the Sun-like stars in our galaxy harbor modestly sized planets, according to a study announced Monday by a team of European astronomers. At a meeting in Nantes, France, Michel Mayor of the Geneva Observatory and his group presented a list of 45 new planets, ranging in mass from slightly bigger than Earth to about twice as massive as Neptune, from a continuing survey of some 200 stars. All of the planets orbit their stars in 50 days or less, well within the corresponding orbit of Mercury, which takes 88 days to go around the Sun, and well within frying distance of any lifelike creatures. 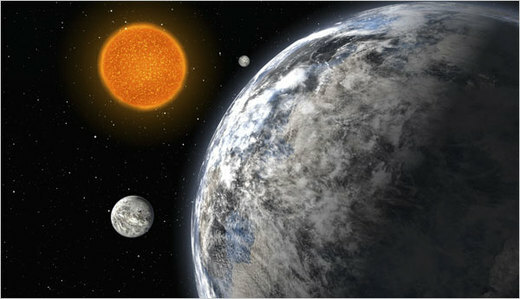 Among the bounty is a rare triple-planet system of “super-Earths” around the star HD 40307, about 42 light-years away in the constellation Pictor. The planets are roughly four, seven and nine times the mass of Earth and have orbital periods of 4, 10 and 20 days, respectively.